Maybe it’s just the historian in me, but I think it can be very useful to go back and take a look at what we were exploring and talking about during October 2008. Close your eyes. Remember the Bear Stearns meltdown? Merrill Lynch? Detroit was in the throes of another one of those generational 100-year floods known as automotive recessions. The problem is that these now seem to happen every couple of decades or less. You could refinance your house with a signature over a fax machine. You could assume a mortgage several times larger than ever before and live in more house than you could ever really need … at the time. What could possibly go wrong? Grab your favorite beverage and stoke up the fireplace. Read what was on our collective minds at the time. And that’s home to me, feels like home to me. With certain apologies to the country band, Little Big Town, the last few weeks have presented an old-fashioned whumping of vast abuse to well-intended investors worldwide. Part of Warren Buffett’s charm is that he hails from Omaha, Nebraska. In his words, it’s an advantage to be a thousand miles or so from lower Manhattan … in the boondocks so to speak. I believe it’s also been an advantage for legions of long-term investors that heed the wisdom and philosophies of George Nicholson and the modern investment club movement: EXPORTED FROM DETROIT. What we do is Better Investing … yes, in the boondocks, with our focus on fundamentals, quality, excellence of management, building return forecast expectations and an effort to channel misguided emotion into the energy of opportunities. Lest we all forget, this agony actually started nearly one year ago. As Dan Hess observed, we’re now treated to 4-day and 4-hour bull and bear markets — marked by 20% swings in the major averages. The massive gains of Monday have already been eroded. We could do a full-hour version of Stephen Colbert’s Wag-of-My-Finger lambasting the guilty, but we’d run out of fingers before we ran out of hooligans. Yes, the slowing economy, the housing bubble, irresponsible mortgage transactions (both ends), that oh-so-normal market paranoia and panic. But the core — at least to me — revolves around two main themes: (1) Greed and heinous liberties taken by “innovative” rhinos, and (2) the human condition that makes understanding cycles so challenging. Make no mistake. This ain’t easy. It hurts to see balances in retirement accounts sag. Our Tin Cup model portfolio has gone from $450,000 to $620,000 and back to $481,700 in less than four days. Very few stocks are immune from the symptoms. Equilibrium has been wrecked by the “innovative rhinos.” We’re seeing the effects of a MASSIVE breach of confidence and trust and it will take a while to restore equilibrium, independent of whatever flavor of recession we endure. We hope you’ve enjoyed the contributions of Hugh McManus with respect to the banking challenges and opportunities whether he’s writing from the boondocks of Switzerland or California or any number of boondocks in between. Hugh and I have spent a fair bit of time trying to understand this “event” and we’ll probably take a closer look at Charles Morris’ Trillion-Dollar Meltdown in days ahead. My take is that the credit default swaps (CDS) are literally a form of lottery ticket. The problem is that infinitesimal odds were in place … and redemption was never supposed to be an issue. We should know better. If the idiots responsible haven’t noticed that we’re having 100-year floods every 3-5 years now, they need some remedial math. I still don’t understand how the “leverage thing” works when it comes to these lottery tickets, but I’m still working on it. It’s little different than if I wandered my neighborhood urging my neighbors to tear up their insurance policies. “I’ll cover your house for $100/month — no problem!” After knocking on (20) doors and collecting $2000/month in “premiums”, life is good. My favorite “innovative rhino” and I are going Maserati shopping together. Why worry? Not a single house has burned down in our neighborhood since we moved in over 10 years ago. No worries. The disruption is massive and it hurts. But hope lives in the boondocks. I’ve also received calls from several friends and family seeking investment opportunities. Our heritage keeps hope alive. 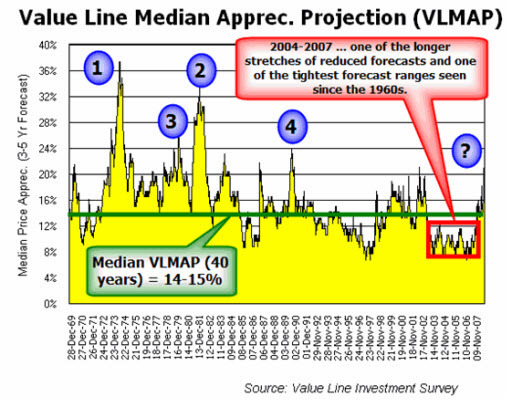 VLMAP (Value Line Median Appreciation Projection) has rarely ascended so rapidly. It’s now in places that beckon for the reverse gear on our investing trucks. But only if the long-term trends stay intact at levels to support the elevated return forecasts … we’ll be watching closely. As the accompanying chart shows, projected returns have soared to rarely-seen levels on a number of occasions in the past. If you’re a member of an investment club or individual investor who persisted in investing regularly, seeking the best companies at the best return expectations you know exactly where this is headed. 1. 1974 Oil Embargo. Disruptions in oil supply, prices and waiting lines. Some of the best selections in the history of the Better Investing monthly Stock to Study were made during the mid-1970s. 2. Culmination of a really nasty recession. The start of the Reagan Expansion and approximate 20-year bull market — with speed bumps, of course. 3. Days of malaise. Better days were ahead. There are always better days ahead. 4. Desert Storm. Recessionary speed bump — advent to 10 of the best years investors have ever experienced. We’re virtually certain to see this weekend’s VLMAP “lap” the field and move into either the #3 or #4 best investing time in the last 40 years. Note that the 2008 VLMAP peak is virtually even with the most promising days of late 1987. When Peter Lynch assumed the reins of Fidelity Magellan, his performance target was to beat the market by 2-3 percentage points. It doesn’t seem like much until you try it. Here in the boondocks, we believe it’s prudent to aim for a five percentage point advantage relative to the overall market. Not everyone achieves the 5% advantage and George Nicholson “confessed” that he had no idea how aggressive this objective was at the time. Think of the voyage as a ship riding the cresting and bottoming waves. Our objective is to stay “above water” no matter how perfect the storm gets. (No George Clooney jokes, please.) Steadily maintaining this margin is one of the keys to successful long-term investing. As Hugh shared earlier today, the measure of success isn’t necessarily the performance results versus any given benchmark — because achieving an 8% long-term return is vastly superior to stuffing Andy Rooney’s mattress . The average EPS growth rate for year-over-year results since 1970 has been 10%. Problem is … average doesn’t happen very often. The annual results were 10% in 1979 and 1996. Truth is … the fluctuations have actually subsided in recent years. The periods of recession according to the annointed economists who declare such things have been shaded. 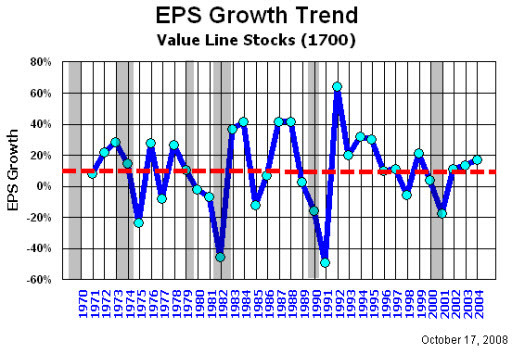 Note the EPS growth dips that generally accompany these recessionary periods. Now take a look at our recent history and the projections for the next few years. There will be some differences due to sample and (I’m guessing) a large-company bias on the longer term Value Line results. How do the swings compare for recent years? Right. Pretty steady, huh? This is the kind of stuff that snuffs memories and leads turnip-truck rhinos to declare that cycles have been repealed. I think one of the largest influences on the events of today is the reality that we have so little experience in dealing with economic/business cycles over the last 20 years. Look no further than the historical frequency of the gray highlighting (recessions) shown on that year-over-year EPS chart. We used to get a whole lot more practice at these “things” called recessions. Now, hands are a-wringing and the whining is saturated with adjectives that include things like Armageddon, holocaust and doomsday. Make no mistake, I certainly know that the pain is real but context, perceptions and perspectives have been assaulted. My family and I live at one of the epicenters … or should I say Ground Zero? … to pour on the emphasis? Many of our friends, family and neighbors work for either Chrysler, Ford or General Motors. The times for the auto industry are not just unimaginable, but “truly unimaginable,” he wrote. And also “challenging,” he added three sentences later. Truly unimaginable? Really? Somehow defense attorney Demi Moore in A Few Good Men comes to mind. By the way, those 2009 forecasts are deemed worst-case scenarios according to think tanks and economists in their research. And 2008 probably isn’t even in the Top Ten Worst … yet. The point is that we’ve clearly been here before. Granted, the specific aspects of the challenge are different but from the larger perspective, cycles have been cycles and will continue to be cycles for the forseeable and unforseeable future. There are cases where our analysis would be well-served to include much more than 10 years of retrospective. It’s something we’ll be taking a much closer look at because we believe that cycles will be cycles … and they deliver beguiling challenges. When The Music Stops … Will You ‘Own’ A Chair? Dan Hess is right about yesterday’s market surge. And frankly, it’s precisely one of the things I consider the most dangerous about these times that we live in. We all remember the childhood game of musical chairs. Our daughter, newly-minted degree from Michigan State in hand, is a teaching intern at a local high school. As the latest episode of market turbulence has erupted, she’s shared stories of teachers seeking refuge in their 403(b) plans by converting their equity-based holdings to cash or “guaranteed return” options. As Warren Buffett has shared in his op-ed a couple of weeks ago, no one — not even the Oracle of Omaha himself — can say when, where and how much … but the music will stop. Here’s a look at a one-day chart of market performance. Again, I emphasize that this one day would have been representative of greater than 50% of most market * years * of stock market heritage. String several days like this together and SUDDENLY an entire wing of gifted, but fugitive, educators (and a nation of “average” investors) has been left in a chilling wake of forfeited opportunity. Study this closely. This is what the gasoline for the engine called “Sudden” looks like. Much has been made that some of these intra-day major moves in the market have been on low trading volume. Many of the rhinos are sleeping or treading water. They never sleep for ever. None of us know what the bottom looks like or if we’re any where near it. But history teaches us about the chilling wake. Ken Fisher recently shared during a Bloomberg interview that every time he hears, “But … it’s different this time …” he immediately begins shopping for high-quality companies for the long haul. Historically, investors have increased cash positions during bear markets but have been slow to reallocate to stocks. Sudden corrections — and sudden rallies — have been a normal part of the stock market over time, and attempting to move in and out of it can be a costly endeavor. Our family is steadily committing cash positions in our retirement accounts to the likes of companies featured here perpetually at Manifest Investing. We believe in the long-term perspective for world class companies — no matter where they’re domiciled. We believe in the resilience of the American people, our leadership companies, and the dogged nature with which we’ve always tackled the challenges that confront us. We may not know a market bottom when we see it, but we know what avoiding the lure of musical chairs has meant for hundreds of thousands of effective long-term investors over several decades. Shop and study at will.